I've been filling sketchbooks like mad. Lately, I've even been sketching things that don't interest me! (!? what ??) Let me explain. April is International Fake Journal Month. The theme for this year's challenge is 'detail,' and you are encouraged to pick a character or topic that you know nothing about. So, I picked Dr. Ilsa Schmetterling. 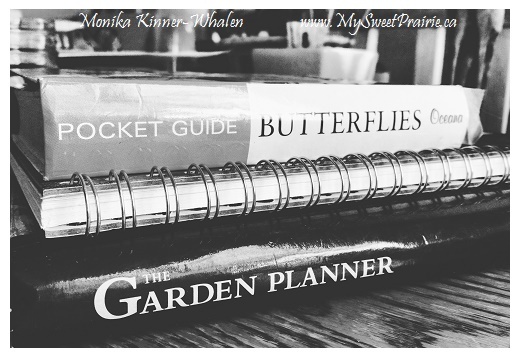 She is a retired biologist who still has some butterflies on her bucket list. I'm working quite diligently on being her. 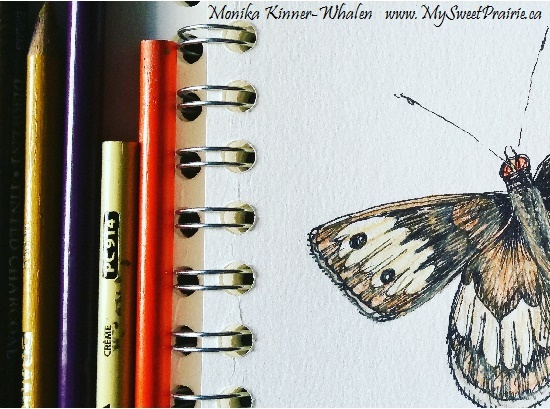 Each morning, I pick a butterfly from my reference books and I sketch it. Folks involved in the fake journal challenge use a lot of different mediums as an effort to experiment. I'm using a black ink pen and colouring in with pencil crayons. That's enough challenge for me! It's been a great learning experience. 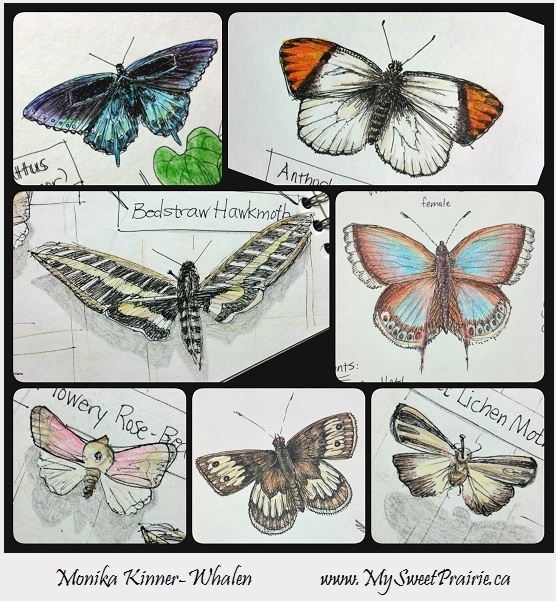 I'm learning about patterns, names, and habitats of some butterflies. I've added the inclusion of details on each one's host plant as well. I spend as much time cross referencing as I am sketching. I'm learning about their life cycles and their specific characteristcs. It's so interesting! I'm having loads of fun with social media. I have always been comfortable with drawing, however, I am definitely feeling the challenge with all this symmetry! That takes some skill. Considering that I am only half way through the month, I'm welcoming all this practice. There you go. Happy Sunday! How interesting! When I sketch wildflowers I like to look them up. I have symmetry issues too! Your sketches are beautiful! What an interesting challenge!